Perform For Life delivers after-school and one-to-one / duo / small group LAMDA and Trinity College London sessions in a small number of schools in Bristol. We’re also Delivery Partners with Southampton Music Hub, providing regular after-school Music / Musical Theatre workshops for students in Southampton schools. At Perform For Life, we know that performing develops skills that can be used throughout students’ lives, both on and off the stage. All this and a qualification! Our tutors are knowledgable in and experienced in teaching the LAMDA & Trinity syllabuses we offer (to find out more detail about these, please contact us). We have a 100% pass rate, with the majority of pupils gaining a High Merit or Distinction. 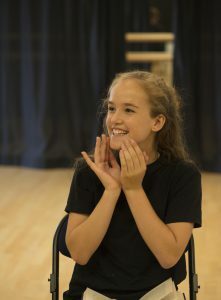 Have a look at our LAMDA & Trinity exams at Perform For Life page for more information and a list of additional benefits. Perform For Life tutors are qualified and experienced within their specialist areas of Performing Arts, be it Singing / Music, Drama / Communication or Dance / Movement. Further, our tutors are patient and encouraging. We acknowledge all students as individuals, and encourage them to be communicative and committed throughout their learning. Our tutors also teach in independent schools, such as Badminton School, Westbury-on-Trym, and King Edward VI School in Southampton. Perform For Life tutors plan meticulously around students’ interests, aims, needs and strengths, and work to build a strong rapport with them. Sessions are industry-standard, and create an environment in which students can feel happy, encouraged and supported – while also being challenged. We communicate directly with students’ parents, meaning there are no additional administrative duties for school staff. We build a positive relationship with all school staff we’re in contact with, and are friendly, communicative and responsive.